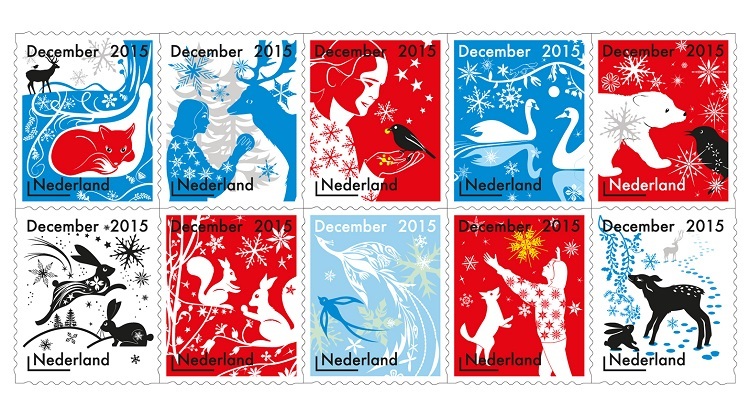 Reindeer, peacocks and foxes adorn these Christmas stamps designed by Studio Tord Boontje for Dutch national delivery company PostNL. Postcards and letters play an important role connecting old acquaintances, friends, and families over the holidays, and to add a touch of festivity to the exchange, the Netherlands’ post delivery company, PostNL, has released a special set of stamps that are ready to adorn mail delivered over the Christmas and New Year holidays. Commissioning London-based industrial product designer Tord Boontje, whose enchanting works include chairs designed for Porto Romana and intricate lighting for Swarovski, the collection comprises 10 endearing winter-themed stamps that illustrate mini stories of both animals and people as they celebrate the holiday season. A white-and-blue stamp captures the image of a man playing with a reindeer, while a red-and-white design shows a woman and a dog welcoming snow with delight. For more information, visit Tord Boontje.